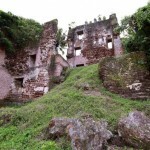 It is situated 71 km to the north of Thiruvananthapuram. Kollam, known for its marine and cashew industries is one of the oldest ports on the Malabar Coast. Once the port of international spice trade, the district also has some interesting historic remnants and a number of temples built in the traditional ornate architectural style, Kollam is the gateway to the magnificent backwaters of Kerala and the eight-hour trip from here to Alappuha is the longest backwater cruise in Kerala. The District Tourism Promotion Council here offers a wide range of backwater tours and cruises. 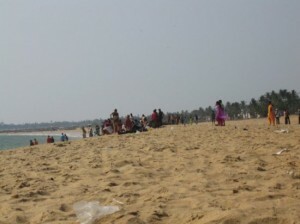 Thangasseri: It is located 5 km from Kollam town. This seaside village of historic importance has the ruins of an Old Portuguese fort and churches built in the 18th century. The Thangasseri lighthouses are open to visitors from 1530-1730 hrs. Thirumullavaram: It is located 6 km from Kollam town. This secluded beach is a beautiful picnic centre and has frequent bus connections to the town. 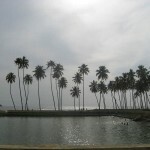 Alumkadavu: Alumkadavu is located 23 km from Kollam town. 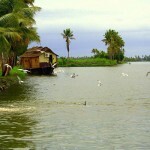 Along the vast expanse of the Kayamkulam Lake is the picturesque little village of Alumkdavvu. This village is the hoe of the skilled artisans who crafted the enormous Kettuvalloms in yesteryears. 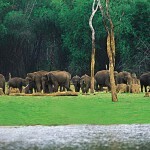 Shenduruni Wildlife Sanctuary: It is located 66 km from Kollam town on the Kollam –Shencotta road. Main attractions here are Elephants, Tigers, Leopards, Bears, and Lion Tailed Macaques. This entry was posted in Kerala, Kollam and tagged about kollam, Alumkadavu, kollam beach, kollam district, kollam kerela, kollam map, Shenduruni Wildlife Sanctuary, Thangasseri, Thirumullavaram. Bookmark the permalink.